Scientists are studying the Earth's magnetic field using the stones that line Maori steam ovens. The cooking process generates so much heat that the magnetic minerals in these stones will realign themselves with the current field direction. 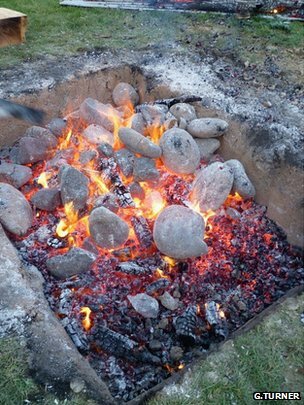 An archaeological search is under way in New Zealand to find sites containing old ovens, or hangi as they are known. Abandoned stones at these locations could shed light on Earth's magnetic behaviour going back hundreds of years. "We have very good palaeomagnetic data from across the world recording field strength and direction - especially in the Northern Hemisphere," said Gillian Turner from Victoria University, Wellington, New Zealand. "The southwest Pacific is the gap, and in order to complete global models, we're rather desperate for good, high-resolved data from our part of the world," she told BBC News. Dr Turner was speaking here at the American Geophysical Union (AGU) Fall meeting, the world's largest annual gathering of Earth scientists. The NZ researcher is working on a project to retrieve information about changes in the Earth's magnetic field stretching back over the past 10,000 years. For data on the last few centuries, she would ordinarily have turned to pottery. When these objects are fired, the minerals in their clay are heated above the Curie temperature and are demagnetised. Then, as the pots cool down, those minerals become magnetised again in the direction of the prevalent field. And the strength of the magnetisation is directly related to the strength of that field. Unfortunately for Dr Turner, the first settlers on New Zealand 700-800 years ago - the Maori - did not use pottery. However, the researcher has hit upon a fascinating alternative. She is now exploiting the Maori cooking tradition of the steam oven. These were pits in the ground into which were placed very hot stones, covered with baskets of food and layers of fern fronds soaked in water. The whole construction was then topped with soil and left to cook for several hours. Dr Turner and colleagues experimented with a modern-day hangi to see if the stones at the base of the pit could achieve the necessary Curie temperatures to reset their magnetisation - to prove they could be used as an alternative data source for their study. "The Maori legend is that the stones achieve white hot heat," she explained. "Well, red hot is about 700 degrees and so white hot would be a good deal more than that. But by putting some thermocouples in the stones we were able to show they got as high as 1,100C, which of itself is quite surprising. At that temperature, rock-forming minerals start to become plastic if not melt." By placing a compass on top of the cooled hangi stones Dr Turner's team was able to establish that a re-magnetisation had indeed taken place. It turns out that hangi stones were carefully chosen, and one of the most popular types was an andesite boulder found in Central North Island. "The Maori prefer these volcanic boulders because they don't crack and shatter in the fire, and from our point of view they're the best because magnetically they behave better - they're formed with a high concentration of magnetite," the Wellington scientist said. "But there are some sedimentary rocks which we can use also." Dr Turner's team is now scouring New Zealand for archaeological digs that have uncovered hangi ovens. It is crucial that a date is recovered with the stones. This can be provided by a radiocarbon analysis of the charcoal left from the firewood used to light the oven. Hangi stones are only likely to take Dr Turner back to the 1200s. For magnetic data deeper in time, she needs to go to other sources. "We're also studying volcanic rocks because they're erupted above the Curie temperature. And the other source of information is lake sediments. Long-core sediments can give us a continuous record at specific places."